Mumbai, December 12: Often, smuggling is related to gold or other precious objects or items. However, the Mumbai Police Crime Branch recently arrested two men for smuggling a snake that is found only in the Indian subcontinent. Moreover, the price of this snake is estimated to be Rs 20 lakhs. Cobra Snake Caught in Mayurbhanj District of Odisha, Watch Video of 19-Feet-Long Serpent. The snake that the Mumbai Police Crime Branch rescued is a red sand boa. The two men were caught in Mumbai's Dahisar locality. 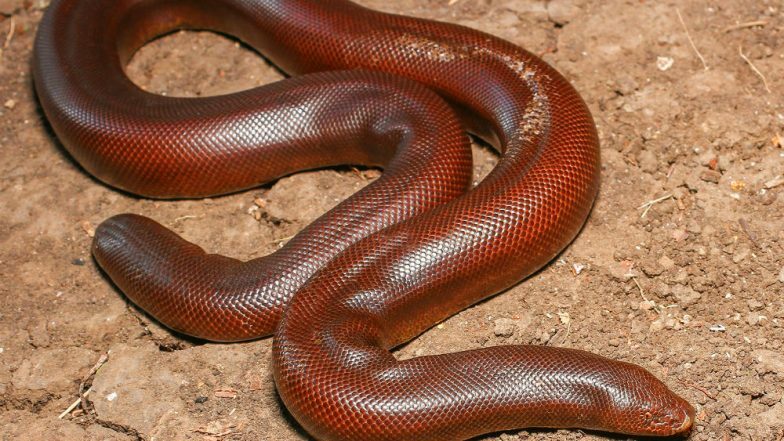 The red sand boa is an endangered species snake. Snake Bite Makes Boy Undergo Rare Hand Surgery in Mumbai. The police acted on a tip-off it had received. The police said that the unlawful deal was supposed to be sealed in Dahisar east, near Sanjay Gandhi National Park. Selfie With Cobra Turns Fatal: Man Tries to Put Snake Around his Neck, Dies After Snake-bite in Andhra Pradesh, Watch Video. The Indian Express reported that officials from Unit 12 of the Crime Branch made and executed the plan to catch the 27-year-old Salman Mubarak Ali, who is a resident of Malwani and Pandurang Pangam, who lives in Nallasopara. Poisonous Snake Found in Flyer's Bag at Cochin Airport. Both the accused were waiting for the buyer with whom they had struck the deal. The police informed that the deal was struck for Rs 20 lakhs. The snake has been rescued and the two men are now being interrogated if they were involved in more such instances of dealing in endangered species of reptiles and animals. IPL 2019 Today's Cricket Match Schedule, Start Time, Points Table, Live Streaming, Live Score of April 23 T20 Game and Highlights of Previous Match!